If you can't find it, it's probably right under your nose. That's how I felt last Thursday as I sped down Intervale Road on my bike with a gang of four friends cruising behind me. It was 5:30, most of us were just off work, and we were looking for somewhere to grab dinner and some drinks and sit outside — maybe a little background music. I thought this might be too much to ask for. I had just recently heard about Summervale, Intervale's series of summertime festivities. 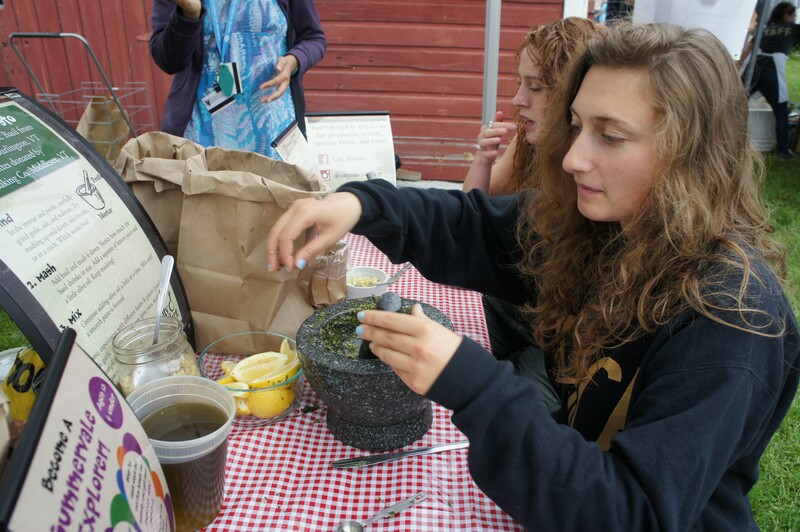 Being a music fan and a pesto person, it didn't take much convincing for me to attend the celebration, which featured Kat Wright & the Indomitable Soul Band and a make-your-own pesto table. It was only about a 15-minute bike from downtown Burlington, so I barely had time to imagine the scene before we pulled into a grassy lot. There, a circle of tents enclosed what looked like a rather large crowd. We had followed some conveniently placed signs that advertised free, secure bike parking and checked in our vehicles.Upon entry, I showed my ID, got a cool stamp of a carrot and access to the Zero Gravity and Citizen Cider kegs. Now I was ready for the full Summervale experience. With pesto on my mind, my friends and I found the tent run by City Market where three mortars and pestles were lined up along with all the ingredients necessary for my favorite green sauce. As I smashed up some chopped basil and a generous amount of garlic, I became skeptical when I didn't see pine nuts or Parmesan. Meredith Knowles, City Market's outreach and education coordinator, explained that they were using raw walnuts as a substitute. "They give it a nice, buttery taste," she said. She was right. After adding a spoonful of crushed walnuts, olive oil, a squeeze of lemon and a pinch of salt, I spread my concoction on a little baguette slice. The result was a fresh, well-balanced pesto that I could've eaten all night. The walnuts gave both a nutty flavor and an irresistible crunch to the smooth, herbaceous blend. In the end, I didn't even miss the cheese. Standing in the middle of the field, we were surrounded by a smorgasbord of the Burlington food scene's big guns. American Flatbread was baking pizzas in a giant, clay oven and giving out $1 slices. A few yards away, crêpe artists at the Skinny Pancake swirled batter onto circular griddles. Lake Champlain Chocolates scooped ice cream across the lawn from the Farmhouse, which was serving burgers. No food tent comes without a long line of hungry customers. We decided to divide and conquer, hoping to hit all the major food groups. Two of my friends waited in a winding queue for Flatbread pizza and Zero Gravity brews, while another went to Bluebird Barbecue. My last friend and I went to the Farmhouse stand, where she ordered one half of a burger topped with fresh spinach and pickled red onion. It was not enough to fill her up, so we scanned the vendors for our next snack. Sugarsnap Farm had two dishes: a beet-arugula salad dressed with a house cilantro-lime vinaigrette and chèvre and decorated with toasted almonds. It sounded delightful, but we were going for something more substantial. 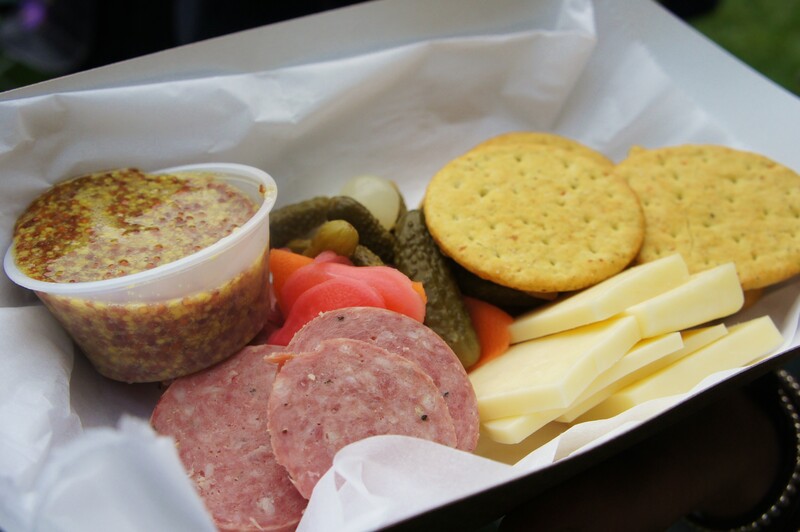 We took the Ploughman's Plate, an assortment of finger food including local cheddar cheese and sliced summer sausage, homemade pickles, maple mustard and crackers. We reconvened 20 minutes later in front of the music tent and laid out the goods: a pulled-pork sandwich adorned with coleslaw from Bluebird, mushroom and sausage slices from Flatbread, and our Sugarsnap special. Someone handed me a cup of Zero Gravity's T.L.A. IPA and I took a big sip of the hoppy, amber brew as Kat Wright swayed into a sultry intro: "This is a man's world..." Belatedly, I realized that I didn't have a plate of my own. I think I was waiting subconsciously for good olfaction to lead me to my food paradise. Behind me, half hidden by a tree, I noticed a small line in front of a silver cart labeled Pinchos! in multicolored letters. A huge, colorful umbrella stretched up into the trees. The whole thing looked like part of a traveling circus. With a closer look, I saw it was the ¡Duino! (Duende) cart grilling up its signature Cubano sandwich and its veggie-friendly counterpart. I opted for the latter, which was filled with seitan, homemade pickles, pickled red onions, cheddar cheese and Mojo aioli. Everything was pressed, almost flattened, between a well-browned sweet roll. I savored every bit of that piping-hot panini. Even though each component had a distinct character, all played well together. The smokiness of the seitan complemented the melted cheddar, while thinly sliced half-sours cooled down the hotter-than-hell Mojo sauce. My friends (all first-time Summervalers) seemed to be enjoying the food and the moment sitting on the bare grass taking in the soulful set list. No one minded the overcast sky or mentioned the few spritzes of rain. Throughout the evening, I heard recurring tidbits from the crowd that matched my own thoughts. "This is awesome," said a bearded guy in overalls. "I had no idea this existed!" said a mom in the cider line. A lot of people were hyped about the band, too, as was I. Seeing Kat Wright at this hour was like an early-bird special. People started folding up their blankets at 8 when the band finished playing. I stuck around like a good journalist (or huge fangirl) to ask Kat how she liked the venue. 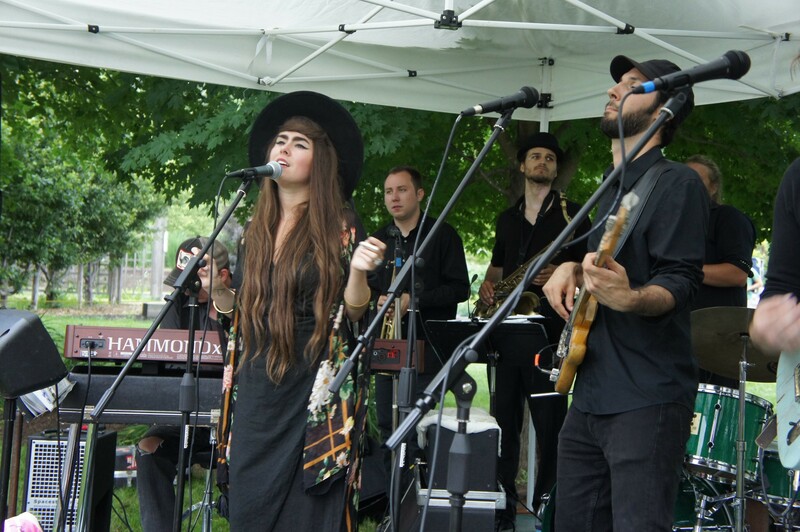 Rocking a flowing black, flowered kimono, a black hat and her signature cat-eye makeup, Kat looked hip and classy as usual. Before I knew what was happening, she was pulling me into a hug and thanking me for coming. She said she loved playing Summervale despite its dinnertime slot. "It's a cool convergence of people that maybe don't get out as much but love live music," said Kat, lamenting a bit over late-night music culture. Couldn't have said it better myself. Kat Wright, you really do rock. Summervale is Thursdays from 5:30 to 8 p.m. through August 27. Walk, bike or drive to 180 Intervale Road. Note to drivers: Parking is limited. For a full list of musical guests, check out the 2015 Summervale lineup. Stacey Brandt was an assistant food writer for Seven Days in 2015.